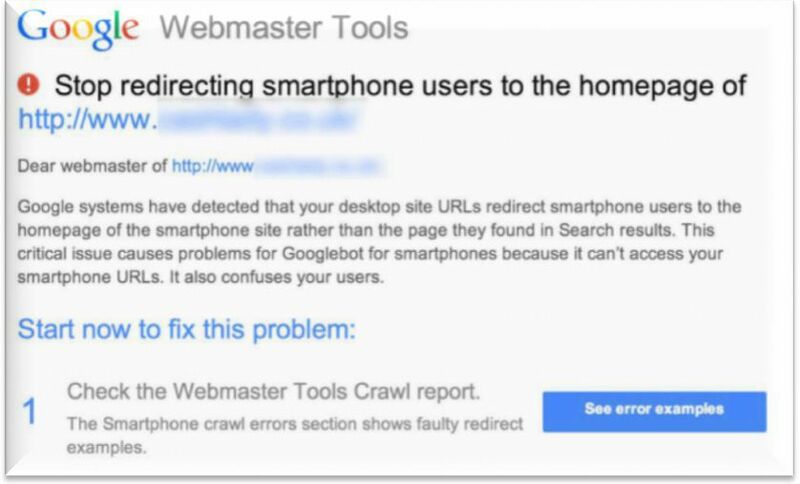 Google says stop redirecting smartphone users to the homepage of mywebsite.com. What does this mean? Reason #1: You are redirecting smartphone users to your homepage instead of the page they found in the search results. To fix this, go to Google Webmaster Tools and ensure that your mobile website isn’t redirecting to your homepage. If your account is set up correctly, linking users to the page that matches their query, then you may have fallen victim to Reason #2. Reason #2: Google made a mistake. Since the mass emailing began, Google has admitted that, in fact, they may have “overenthusiastically” sent out emails, scaring the daylights out of thousands of website owners when, in reality, there was no issue with the mobile site in question. So if you’re confident that your mobile website is taking users where they need to be, ignore the email. But if you find an error, fix it! The homepage is not the place to send potential clients, patients, or customers when they are looking for very specific answers to their questions. If you have any questions, please feel free to call us at 888-886-0939. If you are a client of ours we are more than happy to help you look into the problem and make any corrections needed. If you aren’t a client, talk to your webmaster. And after you’re sure that your mobile website is taking users where they want to go, be sure to sign up for our weekly email newsletters, where we discuss everything from ethical SEO to writing content that converts. We hope the information gleaned there will help you avoid making a mistake like this in the future.